After a couple of days in Phnom Penh, the capital of Cambodia (see post here) we headed off to Siem Reap. In northern Cambodia, Siem Reap is the closest town to the Angkor Archaeological Park, by far the most visited tourist destination in the country. We visited Siem Reap 8 years ago, and were astounded on this recent trip to see how much the town has grown over this relatively short period of time. Siem Reap has a small but busy international airport serviced by many airlines from neighbouring South-East Asian countries, including Air Asia, the most economic of all budget airlines but sadly booked out during the period of our visit. We took a short 30-minute flight with Cambodia Angkor Air, the national airline carrier, from Phnom Penh. Another option would have been taking a speed-boat as we did on our last visit - it takes about 6 hours but it is a fun journey that we spent mostly on the roof deck taking in the sights along the banks of the Tonle Sap. The journey costs £23.50 one-way, but since the roads have improved and flight costs have fallen, the demand for this service has dropped and it no longer operates daily during low season. Since the start of the 20th century, the ruins at Angkor have been on the tourist destination list. By the late 1920s, it had become one of the great tourist destinations of its time in Asia. Stretching over an area of some 400 square kilometres, Angkor Archaeological Park contains the magnificent remains of several capitals of the Khmer Empire of the 9th to the 15th centuries. The most famous are the Temple of Angkor Wat and at Angkor Thom, the Bayon Temple with its countless sculptural decorations. In 1992, the park was declared a UNESCO World Heritage site. One of the most beautiful and elegant hotels we experienced on this South-East Asian trip, the Raffles Grand Hotel d’Angkor is housed in a magnificent 1932 Art Deco building in the centre of Siem Reap. The hotel was built as the first luxury hotel in town, to accommodate the increasing number of wealthy travellers on their grand tours. Like its sister Raffles hotel in Phnom Penh, the Siem Reap location exudes a great sense of place and style of a bygone era. 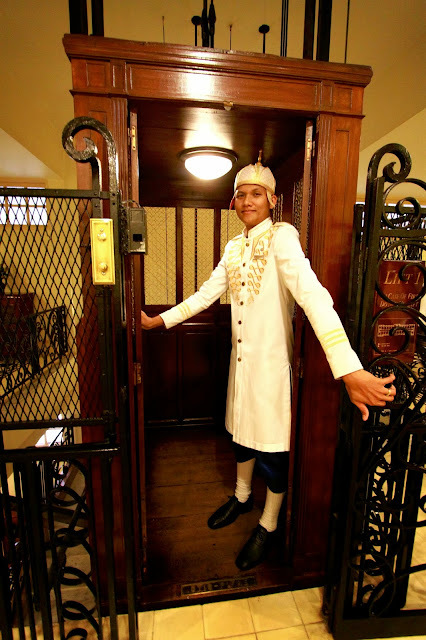 Behind the French colonial façade, the hotel’s interior reflects the understated elegance of its time - a real art deco statement for those who love the style, of which I am a huge fan. I felt at times like a protagonist in a Merchant Ivory production and half expected Simon Callow to come out of one of the rooms in full period regalia. I loved the black and white tiled hallways, the rather dark and soothing interiors, the gorgeous ceiling lights and original 1932 birdcage lift which was beautifully restored and still in use, as well as the Cambodian antique artifacts tastefully dotted around the hotel. The public areas of the hotel are beautiful, including the Elephant Bar - one of the most celebrated in town, and an homage to 1930s Art Deco. It is kept soothingly dark to contrast with the brilliant light and heat of a day’s sightseeing at the temples. The Conservatory had a colonial atmosphere, overlooking the pool and gardens, and was a great place for afternoon tea or an aperitif in the evenings, when there was a pianist performing. Our room was a spacious suite (Cabana Suite) with high ceilings that opened up to a private terrace overlooking the swimming pool, reputedly the largest in the country. The suite, designed in French colonial style, was stunning and had a large four poster bed, two bathrooms, and a living room area by our bedroom. Modern technology, air conditioning, TV, WiFi and the like, were discreetly integrated without looking out of place in a 1930s Art Deco building. The swimming pool was huge, in a beautiful greenish-blue hue, and was the place to be after a long hot day of temple visits. Breakfast was our main meal of the day - not surprising as there was such a huge spread to choose from the buffet. I had their delicious steamed dim sum, stir-fried yellow noodles, a number of French pastries and freshly cut tropical fruit, not counting a glass or two of Buck’s Fizz, with proper Champers and orange juice. That kept us going until dinner time! Local stir-fried noodles + Mortadella slice, my own breakfast combo! Although there has been a lot of development in Siem Reap, it is still a hot and hectic southeast asian town - it was a great comfort to be able to retreat to the tranquility of the Raffles Grand Hotel d’Angkor. I can’t think of anywhere else I would rather stay in Siem Reap. For a “Note on Khmer Cuisine” where I give a brief summary of this fascinating and ancient south-east Asian cuisine, please see my other post on Phnom Penh here. 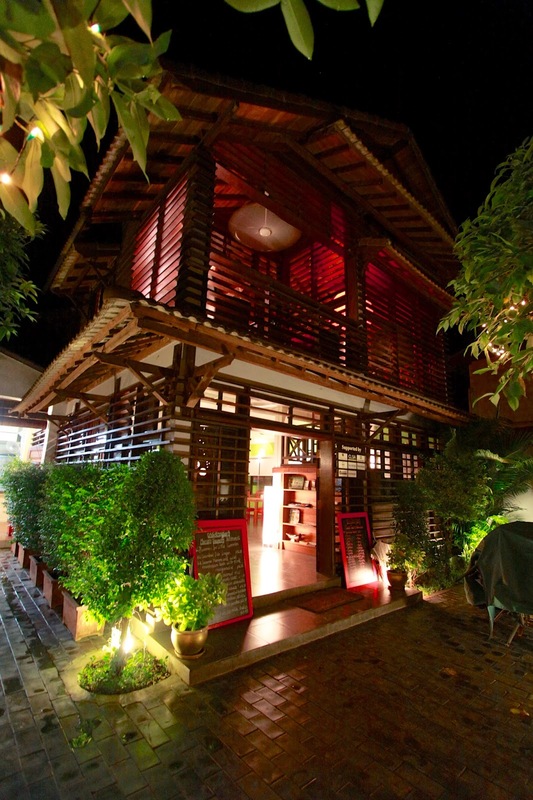 Cuisine Wat Damnak, run by Frenchman Joannès Rivièreis is regarded the top restaurant in town. I had lots of recommendations to visit this place, but sadly it was closed during our low season visit. Another recommendation was Bopha Leak Kloun, for authentic Khmer food, which unfortunately was also closed for the rainy season. Instead, we headed to Marum, another restaurant in the charitable group that provides training for Cambodian youth and street children. This is affiliated with a group of restaurants in Cambodia and Laos under the umbrella of Friends International, one of which, Makphet, we tried in Vientiane, reviewed here. The restaurant is rated highly on Tripadvisor, and is frequented primarily by tourists, so whether the food is authentic or not is open to question. That said, we enjoyed the food we had at Marum. The restaurant is simple but nicely decorated, with a bright, modern feel. We started off with a warm prawn, pork and prahok dip with vegetable crudite and crispy rice (£3.80). Prahok is made from fermented fish, and in this dish was mixed with minced pork and prawn. This is eaten as a dipping sauce into which vegetables and crispy rice fingers are dunked. Alongside, we had a green papaya salad with crispy sun-dried beef (£2.80) - zingy and flavoursome, with a good contrasting textures with the sun-fried beef. We also had a dish of very tender pork belly which had been braised with palm sugar, pineapple and preserved fish, served on sticky rice crust (£3.50). It was accompanied by jasmine rice (75p). On the day we arrived, we had a late lunch in the Café d’Angkor. The food at the cafe is primarily French and Italian, with a few Cambodian and pan-asian choices. The head chef, Wade James, an Australian and former Londoner, trained with the likes of Raymond Blanc in the UK before heading to Asia years ago. We had a couple of noodle dishes - a simple yellow noodle stir-fry with minced pork, shrimps and vegetables (£12), and also a fresh rice noodle soup (£12) in a lightly curried broth with chicken and myriad herbs and vegetables. Both dishes were well made and very delicious. The Angkor Archaeological Park is located about 20 minutes to the north, by car or motorbike, from central Siem Reap. It is easy to arrange guided tours either via hotels or at the many agencies in town. Alternatively, you can just buy a guide book, hop in a tuktuk and go at your own pace for significantly lower rates. You can expect to pay around £8-12 for a tuktuk for the whole day to take you on the ‘Little Circuit’ that covers the most popular and well-known temples including Angkor Wat and Bayon Temple, or £10-15 for the ‘Big Circuit’ that covers a different set of temples, still very interesting but over a wider area. Even more cheaply, you can hire a bike for about £1 per day. Although the area is flat, the climate is tropical and the distances are quite large, and a round trip of 15-20 miles in one day is to be expected. Having had a guided tour on our previous visit, we decided to hire a tuktuk driver for two days, to take us round both circuits. The temples are stunning in size, ambition and beauty. On the first day, we visited the largest and most famous, Cambodia’s national symbol of Angkor Wat itself. Worth viewing at several times of the day including at dawn, it merits at least a few hours of your time. We then visited Bayon Temple, with its 216 carvings in stone of the same face, thought either to be that of Buddha, or of Jayavarman VII, the 12th century king of the Khmer kingdom during whose reign the temple was built. It is a stunning spot. Finally, we made our way to Ta Prohm, the only major temple which has been left unrestored and still has jungle trees growing out of and around the stonework. These three temples are the iconic images of Cambodia, and warrant several days of exploration. If you only have a day or two, as we did, make sure to start early and get these three into your first day’s itinerary. The following day, we took the big circuit. Notable temples included Preah Khan, dedicated by Javarman VII to his father. Neak Poan is a temple set on an artificial island created within a massive man-made reservoir, measuring 3,500m x 900m. Ta Som was notable for its large elephant statues guarding all four corners. With entry passes at $20 per day, or $40 for three days, it makes sense to spread your visits over three days exploring the fascinating temples and engineering works at Angkor Archaeological Park. 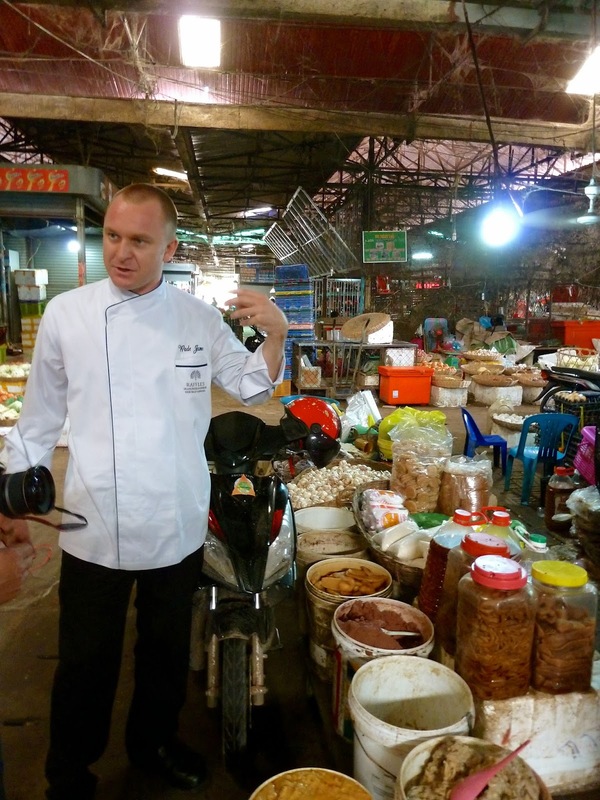 It was a good opportunity to learn more about the raw materials that go into Khmer food, and to see some of the excellent fresh herbs and produce that are abundant in the markets. On returning to the hotel, Cambodian chef Ming Fin took over and demonstrated a five course meal for us. The class was very hands-on, and we each had our own workstation. Luckily, most vegetables, meat and fish had already been prepped, which allowed us to cook an entire five-course Khmer lunch. We started with a refreshing Khmer version of green mango salad, a staple in many southeast Asian countries. A crunchy salad of under-ripe mango julienne cut, with carrot, boiled prawns, dried shrimps and finely chopped smoked fish, basil and roasted peanuts. The salad was brought together with a zingy dressing of fish sauce, sugar, lime juice, garlic and red shallots. Next we prepared a sour seafood soup with pineapple and tomato. The broth was made by taking fish stock and adding fish sauce, tamarind juice, chillies, galangal and sugar. After bringing this to the boil, we added blanched squid and prawns, pineapple and tomato. With such simple ingredients, it was surprising how delicious and well balanced the soup was. For the main course, we made a red chicken curry. Khmer curries start with making kreuong - a blend of spices including fresh galangal and turmeric, kaffir lime leaf, lemongrass, garlic, shallots, dried chilli and shrimp paste pounded in a stone mortar, or blended in a food processor. We sauteed a few teaspoons of the kreuong in hot oil until fragrant, added the chicken pieces and browned them a little. Finally, we added cubed onion and sweet potato, coconut milk, fish sauce, sugar, curry powder and chopped peanuts. We simmered until the chicken was cooked, then added a local oil called makak, similar to palm oil but tasteless, to achieve a red colour for serving. This was a thick and intensely flavoured curry, sweet and mildly spicy. We also made wok-fried black peppered fillet of beef, know locally as ‘loc lac’. After marinating the beef in a blend of oyster and soya sauce with sugar, cornflour, black pepper and chopped garlic, we then quickly seared it in a hot wok. Cleaning the wok, we sauteed some garlic, added the seared beef, and deglazed with Chinese wine. Finally, more freshly ground black pepper, soya and oyster sauce were added, and reduced until thick and glossy. The dessert, pumpkin custard, was made in advance as it needs to be chilled overnight. But we did see it being prepared, and it was very simple. Taking a small pumpkin, cut a hole from the top big enough to allow the seeds to be removed. Prepare a custard by mixing egg yolks, sugar, coconut milk and salt. Strain it into the pumpkin through the hole, and place the pumpkin in a steamer. It takes about 2 hours to cook over a very low and steady heat, and is then left in the fridge overnight. To serve, the pumpkin is cut thin slices, and plated with passion fruit garnish. Simple, but delicious and very pretty on the plate. This cooking class was one of the highlights of our visit to Cambodia. Chef Ming Fin’s passion about Khmer cooking and culture was inspirational. I enjoyed his detailed explanation of Khmer cooking and customs, and how it related to the food of Thailand, Laos and Vietnam, as much as I did his delicious food. At the end, Chef Ming Fin disappeared into the kitchen and recreated the whole meal for us again to enjoy for lunch. Passes are required to enter the Angkor area. They are on sale at the front gate for 1-day ($20), 3-day ($40), or 7-day ($60) intervals. It is easy to arrange guided tours either via hotels or at the many agencies in town. Alternatively, you can just buy a guide book, hop in a tuktuk and go at your own pace for significantly lower rates. You can expect to pay around £8-12 for a tuktuk for the whole day to take you on the ‘Little Circuit’ that covers the most popular and well-known temples including Angkor Wat and Bayon Temple, or £10-15 for the ‘Big Circuit’ that covers a different set of temples, still very interesting but over a wider area. Even more cheaply, you can hire a bike for about £1 per day. Room rates start from £230 per night for a State Room (32 sq m). We stayed in a Cabana Suite (72 sq m) at the Raffles Grand Hotel d’Angkor, which currently costs £766 per night. 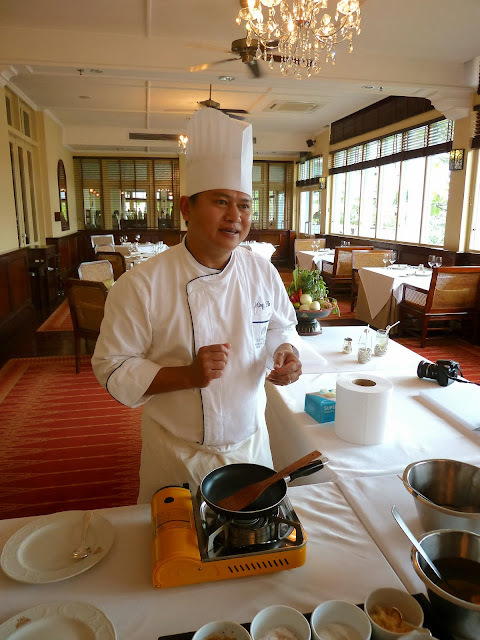 Raffles Grand Hotel d’Angkor Royal Khmer cooking class. This can be arranged with the front desk, and costs $85 per person including lunch. It is usually arranged privately, rather than as a larger mixed class. It seems like Cambodia will be my next destination. Thanks for the post!